KGA LifeStyle Funeral Plan | Funeral Cover ME - Get Covered Today! Cape Group Scheme Advisors (Pty) Ltd was founded in May 1986. Initially they focused more on financial services and pensions funds. The successfully created a funeral scheme for members of a church. They were then approached to undertake a group funeral scheme by a leading insurer. As a result, they established one of the very first funeral insurance administrators in SA. This led them to register an insurance company called KGA Life Limited. KGA Life Limited was born on the first of January 1999. KGA is an acronym from the Afrikaans version of the name: Kaapse Groepskema Adviseurs. The KGA Lifestyle Funeral Plan was born. Today, KGA Life Limited focuses mainly on funeral cover. One of the things that set them apart is the speedy payouts. With a KGA Lifestyle Funeral Plan, approximately 60% of all claims are paid within 6 hours. This massive achievement definitely sets them apart from modern funeral cover providers. You can find KGA Life Limited branches all over South-Africa. With branches in the Free State, Gauteng, Eastern Cape, Western Cape and Kwazulu Natal. They have a sound client base of more than 850 000 members. KGA is fast becoming one of South-Africa’s leading funeral cover providers. With innovative products specifically designed for every market. You can find funeral insurance products with an edge. With the KGA Lifestyle Funeral Plan, you will enjoy benefits while you are still alive. With the KGA Lifestyle Funeral Plan, you will receive discount from more than 200 organisations. This includes ADT, Boston City Campus, Unisa, Tom Tom and even airtime for your phone. This product was designed with young professionals and young families in mind. With the KGA Funeral Plan, you will not only receive a funeral cash benefit. You also get an amazing accidental death benefit. This plan was not designed for extended family. There are only two options available; single person or direct family. With the KGA Lifestyle Funeral Plan, you can expect your payout within a maximum of 24 hours. Although as mentioned earlier, most claims are actually paid within 6 hours. KGA Life Limited understands the need to have cash available as soon as possible. There will be no medical questions or medical examinations required. KGA guarantees your acceptance. The KGA Lifestyle Funeral Plan offers your family R100 000 accidental death cover. You can also apply for R10 000 funeral cover per adult life you insure. You Get 50% Discount on ADT Services. You Can Get R115 Airtime and 100 SMS pm for Only R59.00 pm. You Can Get 20% Discounts on Tom Tom GPS units. You Can Get 15% Discount on your Dent Magic invoice. 10% – 15% Discount on Leading Educational Institutions. This includes Unisa, Boston City Campus and others. You Get More than 200 Other Discounts at Leading Stores throughout SA. 20% – 60% Discount on travel & Accommodation throughout South Africa. Why Should I Choose the KGA Lifestyle Funeral Plan? If you want a funeral plan you can enjoy while you are still alive, this might be the best option for you. 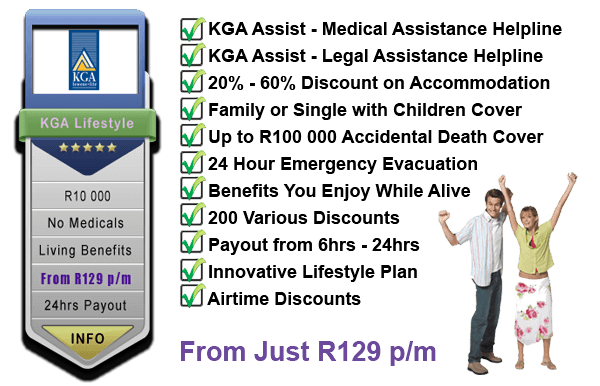 With the KGA Lifestyle Funeral Plan, you will receive super fast payouts. You will also get great discounts and fantastic services. This plan was designed for a younger target market. If you are single or starting a family, this plan will offer you benefits that will enrich your life. You also receive R100 000 accidental death cover. This benefit is for the main member and your spouse at no additional costs. You should use this plan to its full potential. You can definitely save money, while being fully covered with a trusted funeral cover provider. KGA Life Limited is well established and has proven to be a solid company. KGA Life Limited also provides amazing group funeral schemes. If you are interested in getting a group funeral scheme from this provider, feel free to contact us for more information.